a new release from our friend over at Putumayo. OtÃ¡ Records present CEREMONY, arranged by Mister Jaques Morelenbaum. Chris Joss on ESL Music. This is DA FUNK….I have gotten my ears wrapped around the B-3 and deep funkified grooves Chris Joss puts together once again….This with the new Breakestra and Fort Knox Five releases make for a set that is sure to win any FUNK NIGHT beat down. The moments where the guitars welcome a steady pulsing rhythm ties my feet into knots that only made up on the spot dance moves can get them untied….Trrrrrryyyyyy it you’llllllliiiike ittttttt!! The genre-bending duo’s first release, Why Not Now, drew on a unique blend of New Age, R&B, gospel, and Sanskrit chant influences. All Bliss has an even more eclectic, exciting palette, adding rock, pop, jazz and world music styles. “Get Together” is a fresh version of the Youngbloods’ classic hit. “Peace and Joy,” a tribute to John Lennon, echoes the sound of the Beatles. “Soul Song” and “Walking in the Bliss” are structured like chants, using repetition and a hypnotic beat to induce an uplifted trance state. “Shivaya” is literally adapted from a powerful Sanskrit chant. “Be Yourself” is a song with a pop feel and a non-conformist message, while “Mostly Love” evokes the smooth style of the Brazilian jazz singer Sad?. The lyrics for the reflective “Always Near” are adapted from a poem by the Indian teacher Yogananda. “I believe all music is spiritual,” says Narayan. “and these songs are infused with the realism of our shared spiritual journey.” I have found this sound to calm both myself and those around me as I have shared as background and soon over the airwaves and I believe this sound will transition beautifully from smooth to space. By The Julien Kasper Band. I have been spinning music mad by Julien Kasper for many years now and I am once again struck with the sounds put forth on his latest release Trance Groove on Toulcat Records. The nine tracks are filled with personality where needed and some rock as desired. There are some extra jams on the Hammond B-3 Organ by Matt Jenson & T Lavitz that add a certain warmth to their respected tracks making me gravitate to “The Reverend” & “Riff 53” (featuring Jenson) as well as “Chupacabra” and the soft spoken “Carolina Rose” (featuring Lavitz). There are two tracks that are the heavier hitters on the album for my radio ear, “Trash Day” & “Milk Truck” have edges that cut a path right into my ear-ways paved and rolled by Julien on guitar, Zac Casher on drums and Jesse Williams on electric/acoustic upright bass. As always, it is a thrill to listen to and even more thrilling is to be able to share the music of Julien Kasper in my little radio world. The latest release from Lovespirals has me softly speaking to myself and smiling. The slow grooves help me feel like I am skating along carelessly over the ice that sometimes makes its way on our clear travels. The trance sensation produced in this release from Anji Bee and Ryan Lum, is stunningly captivating and a welcomed distraction to listening to music. The down tempo music and vocal temptations seduce the parts of my ears that are connected right to the part of my brain that produces happiness. There are highlight on this album for me personally, “Meanwhile, Irreplaceable Time Flees” right into “Insignificant” really make a set more complete, whereas the opening track “Home” is such a great set starter. This is a classy album that at times I think is even too good for me, but that is why I am so happy to share it with others….I think it’ll find many compatible ear-mates out there. From Palm Pictures comes Baaba Maal‘s newest effort, “Television”. There is also a few remixes of the title track that are set to make the hips shake….The new album Television features Sabina and Didi of New-York based electro-pop sensation Brazilian Girls, who are often featured on the show. With its subtle blending of Electronic Dance elements & West African musical traditions, this record is a groundbreaking successor to his 2001 release “Missing You”. New Orleans, the new release from Clarence Bucaro and brought to us by our friends at Hyena Records is a set of ten songs brought to life by the 28-year-old singer/songwriterâ€™s stunning falsetto vocals infused with the flowing spirit of the Big Easy. The album is named after the city where it was written and recorded and was produced by Anders Osborne and features an outstanding class of musicians, including Kirk Joseph (founding member of Dirty Dozen Brass Band), Doug Belote and Mike Burkhart. Like beads of sweat dripping down ones forehead during a summertime swelter, this album is puddled with romance, despair and the feeling of never letting go of ones youth, it highlights an intense love affair with the enchanting Crescent City as a backdrop…and at times the seducer. by Out To Lunch off of the Accurate Records label. Melvin’s Rockpile feeds listeners improvisational imagination with irresistible dance funk energy while continuously challenging the listeners aesthetic sensibility. As evidenced by tracks such as To the Queen and Captain Stilts, OTLs genre-bending soundscapes range from world, funk, jazz and breakbeat to dub and improvised house, captivating a cross-culture of audiences everywhere. Out To Lunch and Melvin’s Rockpile record release show is scheduled for January 15, 2009 at NuBlu in New York City, where the band holds their monthly residency…but i will have some for you to hEAR tomorrow. The As-Is Ensemble is the sound dwelling of musician/producer Michael Bellar. The album is one that’ll easily get your ears perked up waiting for the next note and the next transition. The As-Is Ensemble has shared billings with many alt-jazzy artists and acts such as: Jacob Fred Jazz Odyssey, John Scofield, Medeski Martain and Wood and formerly were the house band at the world famous Blue Note jazz club in New York City. I look forward to sharing more of this album with you, and I am going to dig in deeper to the other two studio albums (“Like it Is” & “React”). On this latest release in 2009, “Turned On Turned Up” features Rob Jost on bass (Bjork/Imogen Heap), Brad Wentworth (Ryan Keberle/Aretha Franklin) on drums and Percussionist Robert Di Pietro (Norah Jones/Jessie Harris). from our friends at Royal Potato Family.. The newest Flight of the Conchords from HBO and Sub Pop Records is as charming as the boys themselves. I know what you’re thinking…isn’t is dangerous to invite Brett and Jermaine into your home, or for a long car trip….but I think these thirteen tracks are sure to make you think differently and often chuckle out-loud wherever you might be listening in. 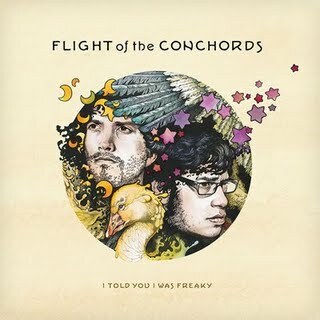 From “Sugarlumps” to “You don’t have to be a Prostitute”, the catchy pop of Flight of the Conchords‘ “I Told You I Was freaky” makes me want to say thank you in special ways to the person who introduced me to the show and the music that oozes out of these goofy lads. Makes me happy to have ears. Improv Jazz that takes improvisation and twists it anew into something not only heard, but into a figure at times, a shape or form. This music keeps me guessing and wanting to be a part of a this in a live setting. Of course Wadada Leo Smith takes the trumpet to all levels of new and beyond, and i mean deep in the portions of my mind where my ears must have dug a secret tunnel, this trumpet sound found a place to gather…allowing me extra time to digest and think it through. The Golden Quintet was recorded live at Vision XIII in June of 2008 and features Vijay Iyer on piano/synthesizer, John Lindberg on bass and Pheeroan AkLaff on drums. The Organic portions was recorded live in New Haven at Firehouse 12 in April of 2009. Featuring Michael Gregory on electric guitar, Brandon Ross on electric guitar, Nels Cline on 6/12 string electric guitar, Okkyung Lee on cello, Skuli Sverrisson on electric bass, John Lindberg on acoustic bass and Pheeroan AkLaff on drums. I have been playing tracks off of “Jazz Around the Globe” for a few weeks now, I feel like I know this album through and through and it has given me time to remember that this thing we all love, music… is everywhere. There are some incredible jazz journeys to speak of and it is so nice to feel as if the captured tunes on a compilation fill the space….after all..space is the place. For me the eleven tracks relay the inner beat of the globe, as felt from the feet upward. The Kora Jazz Trio and Sherele as well as Keletigui Diabate w/Habib Koite & Bamada and Hugh Masekela featuring Malaika leave footprints within me that jazz music’s wind cannot wipe away. To no surprise, I was especially blown away with the song “Destinos” performed by the jazz fusion drummer great Mr. Billy Cobham with Asere….the song was written by trumpter Michel Padron, who is the featured soloist on the track. My words won’t do this album justice…it’s one for your shelves. 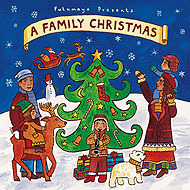 As is (and part of me can’t believe I am saying this) “A Family Christmas” also released by Putumayo. I am not one for the sap that flows musically from the Christmas song tree, but this collection is has itself a festive takes on some Christmas classics, most of which families have passed down global from generation to generation. Add the shake of Big Bad Voodoo Daddy’s “Is zat you Santa Claus?” and the rattle of Leon Redbone’s “Let it Snow” mixed with the roll of The Christmas Jug Band featuring Angela Strehli & Maria Muldaur and stir it all up with the sweetness of Sam Bush‘s version of “Sleigh Ride” and you have got yourself all the makings of a happy holiday season…..and a perfect stocking stuffer!! From our friends at Cuneiform comes a new release that has a grip on me right after the first listening. To be honest, after playing one track on the show, I had three phone calls asking for some insight as to what Zevious is all about. Mike Eber on Guitars, Johnny DeBlase on electric & upright bass and Jeff Eber on drums make a sound at times that is electric jazzed punk and at other times the odd metered groove filled jam-scapes reveal a new fusion unlike most I’ve tried before. There are moments in this album that I want to re-live, at different times to see how I hear it at that moment. Can’t wait to find the right emotions for each track, it hits me just right!!!! The new Release from Slavic Soul Party off of the Barbes Record label has good time infused inside of each track. This album will make you smile and dance before you know what hits you…with a fiery brassy Balkan beat, you’ll be sure to have the funk shakin’ out of places you forgot to look at for awhile… if you know the Slavic Soul party, i need not say more….if you might be new to them, I am glad to be the one who introduces you to them This to me is a very solid release and I will be sure to let it frequent the airwaves when i am pressin’ the buttons. Eldad Tarmu Chamber Jazz Ensemble featuring Yoni Halevy, Johnny Bota & the Timisoara String Quartet. Mark Weinstein & Omar Sosa featuring: Aly Keita, Marque Gilmore, Jean Paul Bourelly and Aho Luc Nicaise.